· And it is also very easy to use thanks to its flight functions such as height control, automatic orientation, take-off and automatic landing. · This drone allows you to watch video in real time on a Smartphone. Its camera allows you to make videos and photos just by pressing a button on the screen of the device, being stored on your smartphone. · It is also possible to perform stunts and turns in 360 degrees at the touch of a button. · Features of Drone Invader FPV Almost Indestructible! - Streaming video to your smartphone. 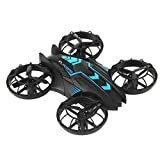 - Drone perfect for learning, it is sturdy and easy to fly. - Height control function helps you maintain your altitude automatically. - Automatic orientation function that facilitates drone flight. - Includes LEDs on the bottom to facilitate night flights. - Function Automatic take-off and landing, ideal for initiation. - 0.3MP camera allows you to take pictures and videos. - Very resistant propeller protectors that increase drone durability. - The App (free and available for iOS and Android) is compatible with VR Glasses, so you can live a true immersive experience. Specifications - Size: 13.8 x 13.8 x 5 cm. - Weight: 1470 grams. - Battery: 7.4v 350mAh Li-On. - Control distance: Up to 60 meters. - Transmitter battery: 4 x 1.5V AA (Not included). - Flight time: About 6 minutes. - Charging time: 90 minutes. - Channels: 4 CH. - Camera: 0.3 MP. - Frequency: 2.4 Ghz free of interference. - Giroscope: 6 axles. Includes: - Drone Invader with camera - 2.4G transmitter with smartphone holder. - LiPo battery. - USB charger. - 4 replacement propellers. - 4 extra protection rings. - Manual.